These paintings were part of an installation at Childhood's End Gallery in Olympia. A single painting one foot high and approximately 75 feet long stretched around four walls of the gallery. I sold sections priced by the foot. People picked the sections they wanted, and I cut them out and framed them. When the show was over I cut parts that were left into 36 inch sections and framed them as separate paintings and gave them new titles. The show also included four hanging panels suspended from the ceiling which were each seven feet tall and one foot wide and painted on both sides. 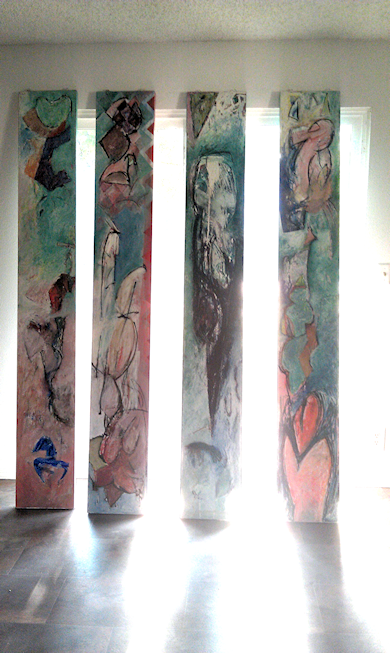 Rhythms in Evolution panels, oil on canvas, each 7' x 12"